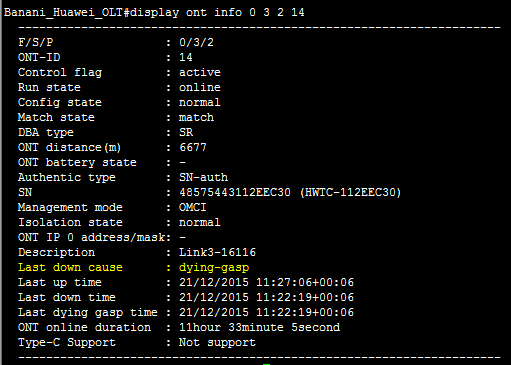 When ONT goes offline then Huawei OLT receives a message from ONT then system generates dying gasp alarm. If power cord remove from ONT without power off ONT device or Load shedding causes electricity power go away then system generates dying gasp alarm. FrameID The ID of the shelf where the alarm is generated. SlotID The ID of the slot where the alarm is generated. PortID The ID of the port where the alarm is generated. 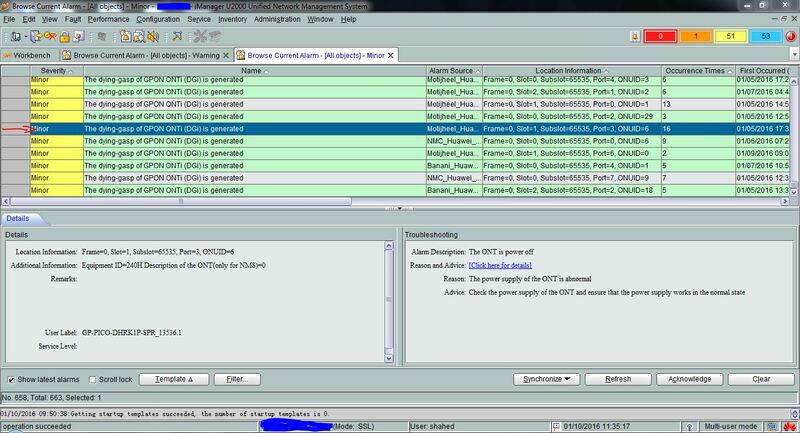 ONT ID The ID of the ONT where the alarm is generated. Equipment ID The ID of the equipment where the alarm is generated. Description of the ONT(Only for NMS) The description of the ONT (only available on the NMS), which can be used to distinguish different ONTs. The services of the ONT are interrupted. The power of the ONT is abnormal or the ONT is shut down. Check the power supply of the ONT, and ensure that the power supply works in the normal state. Then, check whether the clear alarm is generated. If the clear alarm is generated, go to 3. If the clear alarm is not generated, go to 2. Contact Huawei for technical support. The Optical Network Unit (ONU) and the Optical Network Terminal (ONT) are both the user-side devices of the Optical Line Terminal (OLT) and they are both referred to as ONT.